Bathing children with complex disabilities can be a daunting task. Trying to keep the child safe and at the same time make bath time a fun and enjoyable experience can be challenging. Safety at bath time is paramount, the bath seat from SOS is designed to fit inside a standard bath allowing the child to be placed in a comfortable and supportive seat whilst in the water. The bath seat is lightweight as it is made from a thermoplastic outer shell and a waterproof, thermal foam liner. It is mounted onto a plinth which has the benefit of suction cups to ensure it sits securely in the bath and stops the seat moving around. Standard SOS Bath Seats come in a range of sizes and are suitable for children with good postural symmetry. Where a child has more complex needs the seat can be made as a Custom Moulded Bath Seat which would be determined through a, postural assessment. The assessment uses a vacuum consolidation technique to stabilise the child in the optimum position for bathing. Additional safety straps can be also be added to the seat if necessary, this can also be discussed at the time of assessment. 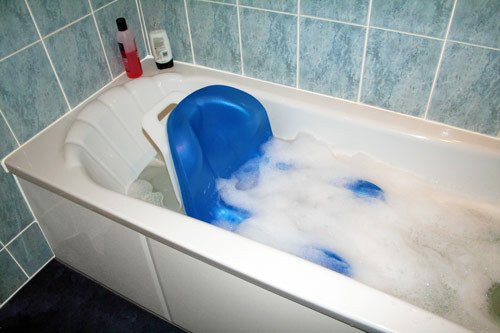 The use of the SOS bath seat helps to make bath time easier and more enjoyable for parent and child. This has the added benefit of leaving parents and carer’s ‘hands free’ knowing that their child is safe and secure but still able to move to enjoy the fun of bath time. This also makes bath time more relaxing for parents and carers too!! Many children with complex needs will be affected by abnormal muscle tone in conjunction with poor or no sitting balance. The SOS Custom Bath Seat provides a high degree of postural stability ideally suited for children who require significant postural support to maintain stability. Providing this level of stability has definite benefits. By allowing children to maintain a stable posture will allow children to feel secure and safe, this will induce greater relaxation, reduce anxiety in the child and allow children to gain more enjoyment during bath time. By securing and stabilising the child’s posture simply allows children to enjoy the fun of bath time for much longer and at the same time allows parents and carers free to play actively with children and also experience a more relaxed bath time experience. Safety at bath time is paramount of course so, always be close at hand at all times. 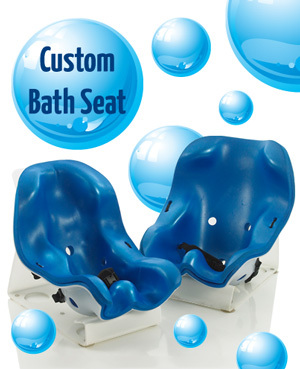 SOS Custom Bath Seats are moulded with a waterproof thermal liner. Highly durable and yet lightweight. Available for children from the age of 6 months and above. Customised to be exactly correct for each child. Available with optional accessories to assist with stabilisation of children during use. For more information about our custom bath seat or to arrange an assessment please contact enquiries@specialorthotic.com or telephone 01283 812860.